Bernie was one of the most dynamic scorers to ever play in the NHL. Bernie played an incredible 1,127 games scoring 475 goals and 1,209 points. Bernie still stays very active in his post playing days — more on that below. He also has a unique company called All Sport Market “it is the first ever real money sports stock market, it’s not gambling not fantasy but a real stock market” You can get more details at allsportsmarket.com or reach out to Bernie via his Twitter handle @bernienicholls9. When did your athletic career begin?I started skating at age three. I played minor hockey at age five. 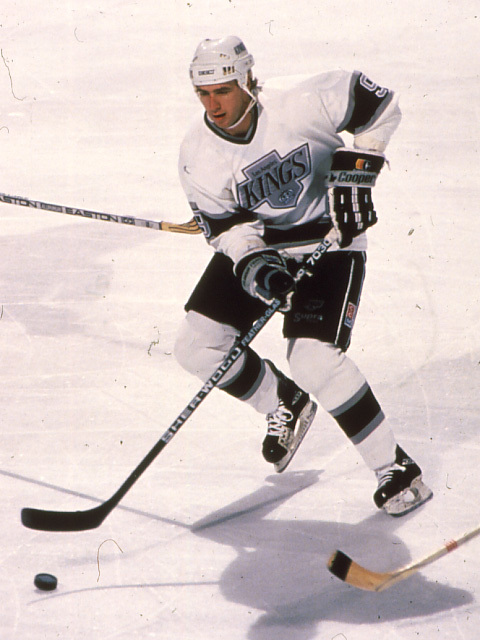 ” Bernie was drafted by the LA Kings in 1980. He played all kinds of sports growing up but his second sport outside of hockey was fastpitch. He was no slouch, playing in the 1980 Ontario Summer games. What do you consider to be your biggest athletic accomplishments?“For me my biggest athlete achievement was making the NHL. I mean you are 1 of 400 kids playing in the world’s top league.” In terms of NHL accomplishments, Bernie is one of only 8 players to EVER score 70 Goals and one of only 5 players to score and 150 points. Bernie also made the Semi Finals four times twice in Chicago, one time in New Jersey and once in Edmonton. Did you workout regularly outside of hockey during your playing days?“No, the players in my day used training camp as a time to get in shape. The LA Kings facility in 1981-82 didn’t have a workout room.” When Bernie played with the Edmonton Oilers in 1991 they had a small workout room but no one used it. It was 1994-95 season with the Chicago Blackhawks when Bernie started working out off the ice. Elite NHLers Gary Suter and Chris Chelios were his inspiration. Bernie remembers doing push ups and sit ups in the sauna. According to Bernie “Chris Chelios was really ahead of his time in term of working out and this likely played a huge role in his Hall of Fame career.“ Incredibly, Chris played until 48 years of age. What does you post retirement workout routine look like?Bernie still stays very active. He does not do much in the way of weights but he does a lot of core and functional training work. When he is in Las Vegas he climbs the Lone Mountain. He also does a lot of stability work, uses exercise bands and does a lot of walking. Lorne’s Take – It was an absolute thrill to interview Bernie. He is one of the most prolific hockey players to ever play in the NHL and in my brief time chatting with him, it’s easy to see why he has had such a successful career and life on and off the ice.